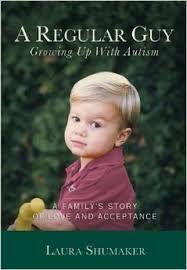 With the exception of 9 copies sitting in an Amazon warehouse in Indiana, I have completely sold out of A Regular Guy: Growing Up With Autism, the book that I self-published 7 years ago. The book, which tells my story of raising a child with autism (my son Matthew) from babyhood to young adulthood, is forever available digitally, which I find comforting. I had no intention of self-publishing my book. It was the traditional route or nothing for me, and on the afternoon that an agent--a really good one--called and said "Yes! I will represent you" it seemed that I was on my way. My agent got close with a few publishers after three rounds of submissions--but alas (as they say in the publishing world), not close enough. This was back before self-publishing packages did everything for you. iUniverse and lulu.com existed, and print-on demand was in it's infancy. But after going to a few workshops about publishing and marketing, I decided to do the whole thing myself. This included a zillion tiny details, including finding a printer and deciding how many books to order. I went the volume discount route. When the first shipment of 1,500 books arrived in (roughly) 34 heavy boxes on large wooden flats, the first thing I thought was "I have made a catastrophic mistake." And a very expensive one. My husband was 10 times more freaked out than I was. But then I figured out how to sell the books. I did it logically. I thought "If I wanted to find out about a book like mine, where would I go?" And I went to those places. I got a distributor to sell to book stores. I went door-to-door to independent bookstores in my area and asked them to sell them on consignment *just* as a chapter of my book was published in the local paper, on the radio, or in a magazine. I pitched book clubs, called schools, libraries and disability groups and offered to speak for free if I could sell my book. I even got on a local morning show. I almost got on Good Morning America, but then I didn't. I should mention that these marketing activities did not come naturally to me, and it pained me to be a smiling and semi-pushy self-promoter. And there were times when my efforts bombed in a big way. Like the time I flew to Chicago at my own expense to speak at an event in the suburbs in a torrential rain storm...on the night of the Obama/McCain debate...and no one showed up. But the image of books stacked in my garage kept me going. I learned from my mistakes, and retooled. In all, I sold about 7000 (paper) books, really great for a self-published book. The digital sales are impressive too, though I haven't counted the exact number. "Is that all?" commented many, "A friend of a friend's sister wrote her book in three months and has sold many millions" or something to that effect. "If only you could get one Oprah..."
I learned to smile and shrug. You write a book, you sell a book, then what? I'll tell you what. Writing that book changed my view of the world, and my contribution to it. When I started writing, it was all about the trials of having a child with autism. How hard it was. How it affected me, my family and friends. And there was a lot of tricky stuff. But in the process of writing the book, I grew to appreciate how hard it was to be my son Matthew, and other people with disabilities, in a world that wasn't ready to accommodate them. I learned more and more about the world of disability as the author of an autism and disabilities blog on SFGate.com (the web version of the San Francisco Chronicle), the most valuable and life enriching non-paying writing gig a woman could ever ask for. (I'm still at it, by the way). There, I continue to write stories from a parents perspective. But not as much as I used to. Now, I am spending more time listening to people who are living with disabilities, and hearing their stories. "We are living in a world not constructed to house us," says my friend, self-advocate Stacey Milbern. "Regardless of whether it's an intellectual, behavioral, physical, sensory or chronic health disability, almost everything we touch was not meant for us, and we have to -- on our own or if you're lucky, with other people -- figure out how to make it work." From a practical standpoint, the writing, speaking, advocating, and listening has helped me become a great communicator (if I do say so myself) an even better writer, editor, marketer, SME (Subject Matter Expert. YAY!) which has enabled me to do good work elsewhere. And all of it has enhanced my sense of humor, and made me a better mother. At least I think so. Let me go ask my sons. Snap up one of the last copies of my book here..